Q1. Which network security element, if attacked, could directly affect traffic flows going across a segment? Q2. Which of the following are main aspects that must be considered when securing a network? Q3. Which of the following describes a technique that provides security to a network through the use of a multilayer approach? Q4. Which of the following are the main sections of the Security Control Framework? Q5. 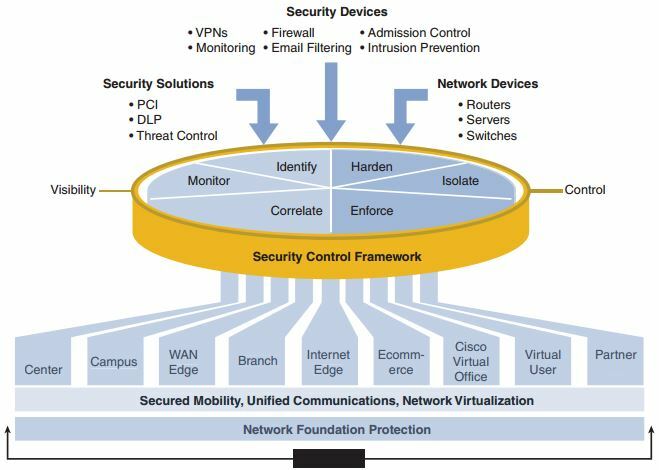 Which of the following actions are defined by the Security Control Framework? F. All of these answers are correct. Q6. Which of the following technologies are used by the monitor action defined by the Security Control Framework? Q7. Which of the following technologies are used by the enforce action defined by the Security Control Framework? Q8. Which of the following parts of SAFE defines security mechanisms that secure the network infrastructure itself? Q9. Which of the following are valid design blueprints defined in SAFE? Q10. Which of the following are valid steps in the SAFE architectural lifecycle? Q11. The _____ security aspect protects network data from being altered in transit. Q12. The _____ ensures network and service availability. Q13. The SCF model defines the harden, isolate, and _____ actions to obtain complete control. Q14. To provide _____, the SCF defines the identify, monitor, and correlate actions. Q15. The Network Time Protocol (NTP) is typically used with the _____ SCF action. Q16. The design blueprints have been designed around various PINs in a network; PIN stands for _____. Q17. The SAFE design principle _____ was developed to make sure that designs were easily capable of meeting industry benchmarks. Q18. The security focuses of service availability, DoS/DDoS protection, data confidentiality/integrity, and server protection are used most in the _____ design blueprint. Q19. The part of the network that typically connects to end users that all exist within similar geographic areas is defined in the _____ design blueprint. Q20. The management design blueprint is defined to increase security through the use of the _____ security focuses.